Building your next extension on site with modular accomodation is one of the best ways to create space without a permanent commitment. The prefabricated buildings that are available today are a far throw away from the more traditional portable buildings that most of us have come to know. Temporary buildings are convenient, flexible and can be very elegant and many architects have come to know that modular buildings can offer an economical way to add space that otherwise may be difficult to do. 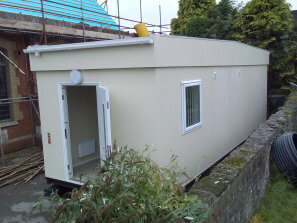 If you know buildings, then get to know Modular Direct who create buildings that fit you and your needs. They work with many industries including Healthcare, Education, Leisure and Construction and have already assisted many clients with structures that suit. The team provide a huge range of products and have modular buildings to hire or buy that will add almost instant space to your plot. They will work directly with you, the client, to design bespoke temporary buildings that are created to offer you the space you need, whatever your field. Speak to the team to find out more today.